24-Hour Locksmith Spring: What Should I Do If My Keyless Entry Isn’t Working? Hello! Welcome back to the Affordable Locksmith of Texas blog! Lately, we have been discussing all things vacation home-related. It’s getting close to that time of year, and it’s the perfect time to make sure that you have all of your proverbial ducks in a row. Part of the pre-vacation season process is checking your security and making sure that the you have the best security system for your needs. Pre-season security checks include making sure all of possible points of entry are secure and considering the installation keyless entry. Keyless entry can make your life and your guests’ lives easier, because you don’t have keys to keep track of and so you never have to worry about rekeying your entire home. You simply have to change the code, which can be done easily from your phone, computer, or tablet. Also, if it is part of a smart system, you can even turn the lights and HVAC system on remotely for your guests before they arrive. Keyless entry can provide you with many perks and can even show you when your home was entered. 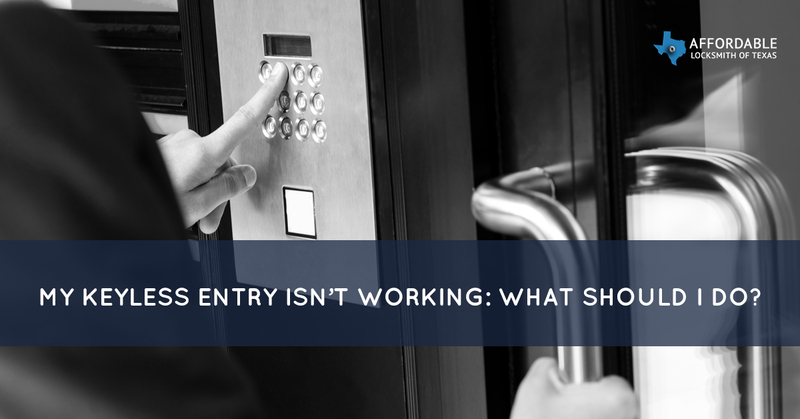 Even with all the advantages, it is easy to be unsure of a new system and wonder what to do if it doesn’t work, especially when a traditional security system is so straightforward. If your worries about your keyless entry not working are keeping you from installing this advantageous system, keep reading to learn about easy solutions. When you get your keyless entry installed, ask the locksmith about how to change the batteries. When it comes to your system not working, it is usually due to it needing new batteries. Thankfully, your system should only need to have its batteries replaced every three to five years and will usually give you fair warning when its batteries are starting to get low; you don’t have to worry about coming home unexpectedly to a dead system. If your keyless entry system is still saying that the batteries need to be replaced even though you have just replaced them, call your local locksmith in Spring. There may be another issue with your system that will need to be addressed beyond just replacing the batteries. If changing the batteries isn’t the issue when you have a dead lock, then your problems may be the result of a poor internet connection. The ability to change the codes remotely comes from the locks’ WiFi connection. Usually, if there is a lost connection, you don’t have to worry about being locked out. However, check with the locksmith who is installing your system or the manufacturer’s manual to find out what the default response of your system is to lost WiFi connection. If you continually are losing connectivity, check your internet to make sure you aren’t having general internet or router issues. If that isn’t the problem, then call your local locksmith to have them check the lock itself. If you are still unsure why your keyless entry isn’t working, call the locksmiths of Affordable Locksmith of Texas! We would love to help you get your system up and running as it should be as soon as possible. Technology has advanced enough that your system should be providing you convenience and reliability, rather than difficulty and frustration. Locked out and not sure what to do? We have your back with our 24-hour locksmith services. Our guarantee to all of our clients in Spring is to respond to your inquiries for help in 15 minutes or less. We understand how frustrating and alarming it can be not being able to enter your home. No matter what kind of system you have, we can handle it. For locksmith services that you can rely on and trust, call us at Affordable Locksmith of Texas.